In New York? 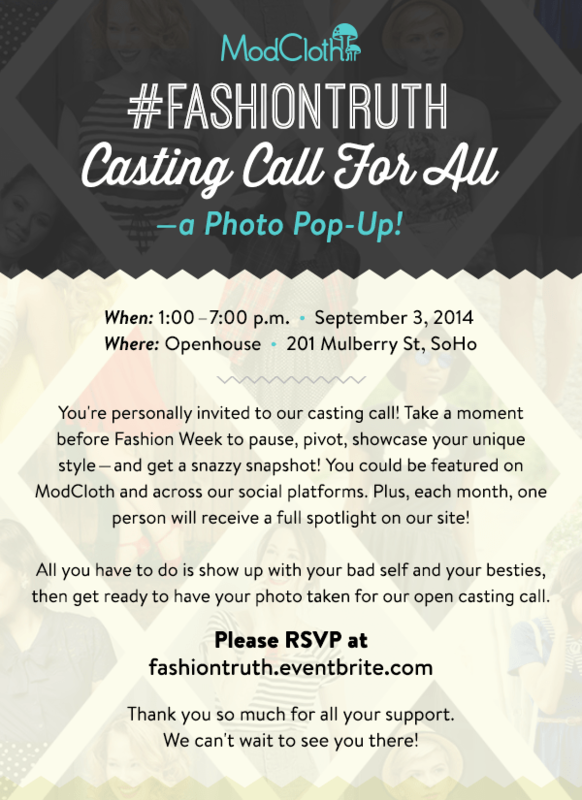 ModCloth’s #FASHIONTRUTH Casting Call for ALL! Fashion mavens, rejoice! ModCloth is inviting you to come showcase your unique style at their #FASHIONTRUTH Casting Call for ALL event in New York City on September 3rd. All you have to do is show up in your cutest outfit and you could be featured on ModCloth and across their social platforms. Anyone and everyone is invited, so if you’re in the area, grab your friends and go — this is an event you won’t want to miss! Head to the ModCloth blog for more details and RSVP info.